In response to Saturday’s peaceful protest that turned violent when security workers for DAPL unleashed pepper spray and vicious attack dogs on a crowd of water defenders. I demand answers from North Dakota’s governor and law enforcement. The State of North Dakota is quick to erect military barricades and try to portray us as savages when our water defenders merely park their cars along the side of road, but where were all the police when dozens of innocent and peaceful Tribal members, including many from my tribe, were intentionally shot with pepper spray and ravaged by vicious dogs at the hands of DAPL’s mercenaries? 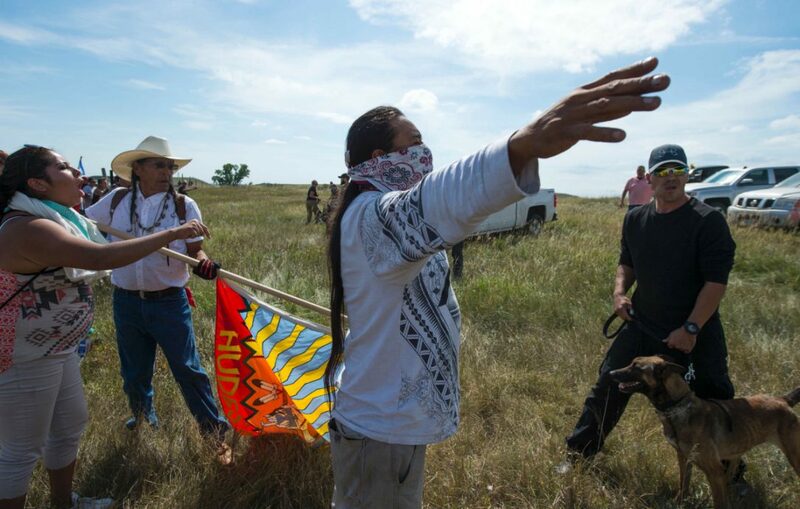 On Saturday afternoon DAPL’s private security guards initiated force against a crowd of mostly tribal members who were protesting in a non-confrontational manner to stop the ongoing stripping of land, including areas of land where documented sacred sites have been discovered. DAPL used dogs and pepper spray to attack innocent, unarmed women and children, while helicopters were threatening overhead. They will stop at nothing. They do not know the meaning of humanity. According to many witnesses at the scene, neither state nor county law enforcement officials were at the construction site during the incident. It is extremely suspicious to me that law enforcement became scarce at the exact time when DAPL’s hired guns were planning to attack the water defenders. 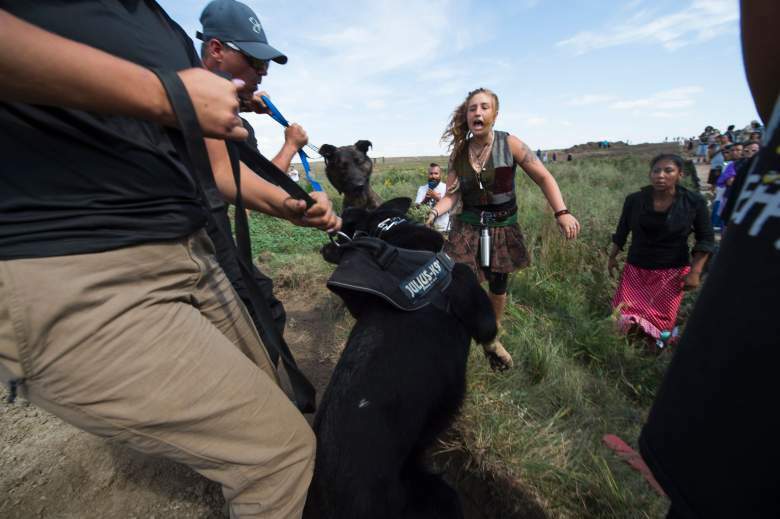 A press release recently issued by the Morton County Sheriff’s Department insinuates that the peaceful protesters were the provokers of the incident because several individuals allegedly cut a fence and entered the work site. State and local law enforcement officials keep telling the media, without proof, that the protesters are committing unlawful acts. In my opinion unleashing vicious attack dogs on women and children, and spraying dozens of unarmed people simply because they are exercising their constitutional right to assemble, is unlawful. I am calling on all members of the Cheyenne River Sioux Tribe to avoid traveling to or doing business in the Mandan-Bismarck area until this crisis is resolved. I fear for my people’s safety. Today’s act of terrorism shows us how desperate DAPL and the State of North Dakota government are to keep things at a status quo. I am concerned about the escalating violence against Natives in that area. When will Governor Dalrymple step up and meet with Tribal leadership in an open, good faith effort to resolve this conflict? The key to settling this situation is in the hands of North Dakota leadership. I requested a meeting with Governor Dalrymple last week, but as of today has received no response. Please do not hesitate to contact me at 605-964- 4155 or haroldcfrazier@yahoo.com if you should have any questions or concerns. This entry was posted in Tribal Leadership and tagged Cheyenne River Sioux Tribe, Dakota Access Pipeline, Governor Dalrymple, Harold C. Frazier, North Dakota, racism, Standing Rock Sioux Tribe by lrinspire. Bookmark the permalink. They released pit bulls on peaceful UNARMED protectors WITH CHILDREN. ~ President Obama the world is watching!! Potus do something!! ~ Na NEOBOROŽENE zaščitnike Zemlje z OTROCI so spustili pit bule. yeah, he’s in China visiting. Back turned against us. Please don’t contribute to the demonization of Pit Bulls folks. I know that isn’t your intention, but please remember: These animals are being used as weapons against the people, and they are not responsible for it. Dakota Access are the ones who should be demonized! the article never states pit bulls. When. Will we leave these nations. Alone. ???????? Please ,please. Send. Peace. Have they not waited long enough ?????? Do tribal members call local police? And what is their response? Tragic event, but there were other dogs besides pitbulls, Lili SoRum. German shepard dogs being one of the strongest dog bites out there. Our group from Kentucky wants to come and stand in solidarity with you. Some of us are unable to camp (accessibility needs) so we were going to get hotel rooms in Bismarck. From reading your post we see that would just be bringing “tourist dollars” to the area, thereby helping the Govermor in the long run. What do you recommend? Are there any native-owned housing options? We don’t require anything fancy. Why would a corporation hire a private security to bulldoze lands that they were told contained burial and cultural sites and didn’t even have all its permits to be building this pipeline. Seems you or I couldn’t just up and build anything anywhere we wanted without having permits. Who is the sick one? This is a travesty. No respect, no honor, and violence against those who are attempting to be peaceful. Turtle Mountain has been very supportive. As for impact, the Missouri river and its numerous streams and creeks provide water to nearly 10 million people from Montana to St. Louise including drinking water, water for farmers and ranchers, so many peoples will be impacted by the pipeline. This is sad…once again peaceful gathering of people to protest Dakota Access Pipeline..This company and the state of North Dakota should be ashamed of yourself. Obama…really..maybe if it were black people he would say something because that race calls depression for 300 hundreds years..yet as history shows 500 hundreds years for the Natives of this so called United States of America..I have 3 daughters who are members of Standing Rock Sioux Tribe (enrolled members). How sad. America wake up..big corporate business can not rule our land just for their profit. 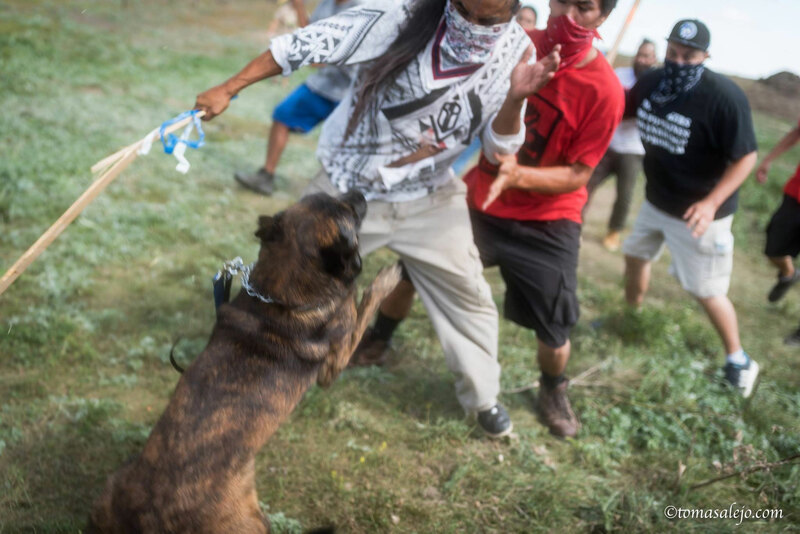 I feel what should happen to those handlers who dogs attacked innocent protesters and for those who used pepper spray..should be charged…period…this is sad to watch and see…prayers to the Cheyenne River and Standing Rock tribes..
Hi, I would like to have the phone numbers of the governor, law enforcement and FBI. I want to know why these illegal acts are being allowed and what they plan to do to stop it. I am going to put those numbers on my Facebook page and encourage all my friends to make those calls and pass them on to their friends. I will not be afraid to ask them how much they are being paid off to look the other way and how much they are being paid to steal your land. They don’t do nothing for nothing so someone’s pocket is being lined. My apologies, your article doesn’t mention any breed by name. I was trying to respond to Lili SoRum’s repost comment and posted directly to you instead.